Float on over to.... Nightmare on Normal Street. We all float down here in Hillcrest... and when you're down here with us, you'll float too! 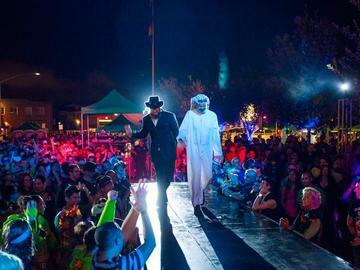 The highly anticipated “Nightmare on Normal Street” Halloween street party is taking place on Saturday, October 28, 2017, and benefits the San Diego LGBT Community Center, and Fabulous Hillcrest. Come join us for a psychotic time and enjoy San Diego's #1 VOTED Costume Competition and Halloween Dance Party. If you are in San Diego this is the place to be and you don’t want to miss out! There will be late night live entertainment, multiple costume competitions for you and for your furry, fuzzy, feathery pets- with sassy judges, and two gigantic bars and our all-new "Real Time - LIVE Audience Vote By Text!" Eat, drink and be scary with our VIP pass for $45 (pre-sale), which includes two cocktails, $7 food credit, front-of-the-line access to get into the event, separate VIP Bar, private restrooms and private stage viewing. When you arrive at the event, head to our Box Office and check-in to register for the costume competition. Questions - contact Member + Marketing Director Eddie Reynoso at eddie@Hillcrestbia.org or call (619)299-3330.